Surrey's Eagle Radio is launching a spin-off station on DAB digital radio on Monday 4th April, playing music from the 1950s to the early 1980s. 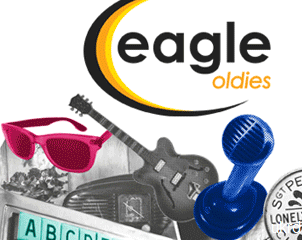 As part of UKRD owned Eagle Radio’s 20th birthday celebrations, Eagle Oldies goes live on Monday, promising to be ‘never more than a minute away from the next great song’, with shorter commercial breaks and less clutter creating room for more music to be played. In addition to being live on the Surrey local DAB multiplex, which covers most of the county, South London and the north east corner of Hampshire, Eagle Oldies will also be available to listen to online at www.eagleoldies.co.uk . Listeners can already retune their DAB radios in preparation for the launch. The new station will have an extensive playlist of songs dating back from the 1950s through to the early 1980s, with an especially strong focus on music from the 1960s and 1970s. There will also be regular music features including an hourly showstopper celebrating music from the musicals and bigscreen. Making a return to the airwaves for the launch is Mark Chivers, a popular presenter who has been a regular feature of both the County Sound Radio and Eagle Radio line-ups.